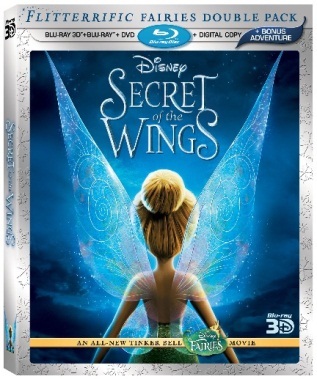 The girls and I were invited to a preview of "Secret of the Wings", coming out on DVD and BluRay on October 23rd. Miss E. loves Tinkerbell - I tried to keep it a surprise but she immediately asked if it was "Secret of the Wings" when I told her I was taking her to a movie. She badgered me until I caved and admitted that yes, this WAS the movie we were going to see. The film was very cute - it opened with the normal fairy characters. ( If you want to learn more about the fairies - click here). The premise of Secret of the Wings is that there are two lands in which Fairies exist - one where it is warm and is occupied by Spring Fairies and one where it is cold and is occupied by Winter Fairies. The Spring Fairies cannot visit Winter Fairies and vice versa - each fairy must remain in his or her own side. Tinkerbell questions the rule but is reminded that it is for their safety. This is a cute movie for little girls - a little predictable but it is very cute. We loved the introduction of the new characters, especially Periwinkle, who has a very special connection to Tink. There was one library scene that I thought tended to stereotype but other than that I found the movie to be enjoyable, family oriented and amusing. I would purchase this for my DD. Disclosure - I received admission to a private press screening for review purposes only. I did not receive any form of compensation. Del Monte Fruit Cups - Fall inspired!